This must be that Woodstock place Mum and Dad are always talking about. Ah, another classic point 'n' click adventure remastered by Double Fine. They already managed to remaster Grim Fandango last year and now it's Day of the Tentacle's turn. Day of the Tentacle ranks as one of my top 10 games of all time so it was a no-brainer to acquire a copy (or two, as I actually have both a GOG and Steam copy!) when the game was finally released. But don't take my word for it, the game also featured on the Choicest Games Top 100 in the #40 spot (along with many other classic Lucasarts point 'n' click adventures). The question is, does this remaster do the original justice? Will those who played the original over 20 years ago enjoy the remastered version by Double Fine? Also, will those who have never played Day of the Tentacle find something to enjoy? Double Fine have decided to only make subtle changes in its remaster of Day of the Tentacle, giving the game higher quality graphics and MIDI. This is different to a "remake" or a "reboot" such as what Firaxis did with XCOM: Enemy Unknown; in that case a new game was built from the ground up that incorporated many common elements from the original game but was quite a bit different in terms of its execution. Some gamers would appreciate the changes as it makes old games more accessible to a modern audience and often includes improvements to the gameplay. Purists though often hate "remakes" since they deviate too far from the original formula. So if you're one of those gamers that was hoping for a lot of change in the remaster, you're going to be disappointed. In fact, I would've liked it if they happened to redo the soundtrack using a live orchestra (similar to what Double Fine did with Grim Fandango), however that may have been a bridge too far, and besides, the original soundtrack was decent enough anyway. As someone who thoroughly enjoyed the original though, the remaster is fantastic since it doesn't touch any of the puzzles or story and just gives you a sharper, higher definition experience for modern PCs. Also, if you want to go all retro, you have the choice to revert to the original graphics, soundtrack and interface too. I love movies with time travel and I love games with time travel. 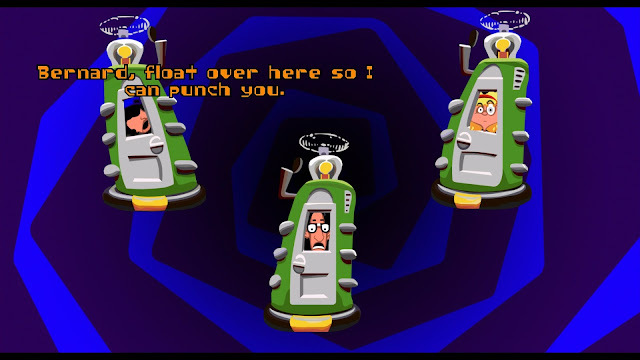 In fact, Day of the Tentacle is probably the first computer game I played that featured time travel and it did so with a bang. Not only did you control one character, but three characters during different periods of history; one is thrown back 200 years in the past during American Colonial times, another is thrown 200 years in the future (a dystopian one where tentacles have taken over the world) and another stays put in the present... well in 1993 at least. My favourite puzzles involved changing things back in American Colonial times which would have a flow on effect on the future. I also enjoyed talking to humourous caricatures of Ben Franklin, Thomas Jefferson, John Hancock and even George Washington himself. The remastered version of Day of the Tentacle contains a whole bunch of developer commentary from guys who are now veterans of the gaming industry: Tim Schafer, Dave Grossman, Peter Chan, Larry Ahern, Peter McConnell and Clint Bajakian. I found the commentary interesting as the developers talked about the challenges they faced working on 90s hardware, such as Clint Bajakian commenting on how the composers struggled to keep MIDIs under 32 kilobytes in size, or how the judge tentacles in the future waddled as one character since animating all of the tentacles hopping around would've been impossible. When I played the original Day of the Tentacle, I used to remember that whenever audio samples had to load there’d be a lag for a second or two during animations. This is no longer the case. Yay! Just like the original Day of the Tentacle you're able to play its predecessor, Maniac Mansion within Maniac Mansion...II (Day of the Tentacle is Maniac Mansion II you see)! So you're able to play a Maniac Mansion game within a Maniac Mansion game. Neat! And on the topic of the original Maniac Mansion, thankfully you don't need to play the original game in order to enjoy Day of the Tentacle. Back in the early 90s when I originally played Day of the Tentacle it didn't matter and it still doesn't matter now (although you'd obviously understand the few in-jokes if you did). I loved the original game so much and since this remaster is pretty much just the original with hi-res graphics and higher quality MIDI, my opinion isn’t likely to change. I can appreciate that with all things nostalgia, things you played or watched when you were younger don’t quite hold up when you experience them again as an adult. With Day of the Tentacle Remastered though, I have to say that it’s held up pretty well. However, that’s not to say the same will apply to everyone, especially people who are playing this for the first time. I've been waiting for almost two decades for a modern remastered version of this classic. Actually, I would've been happy with just the original Day of the Tentacle and it was so painful to see Steam release a whole bunch of classic Lucasarts titles but none of the other classics like Grim Fandango, Day of the Tentacle or Full Throttle. Thankfully, it seems Double Fine are going to rectify that (and make a bucketload of money while they're at it). It's a higher definition version of the classic Day of the Tentacle with developer commentary... and that's about it. However, if you loved the original game you won't be disappointed with this remastered version of one of the best point 'n' click adventures of all time. For newcomers, this is a great opportunity to experience a classic, time travel, cartoon point 'n' click adventure developed during the Golden Age of Lucasarts. Is the game worth $14.99 USD? : Yes. With the current exchange rate, that’s about $20 to experience one of the best point ‘n’ click adventures ever.